Doing double duty ... that's the story of my life now. It's hard. I realize that I only have one child, and so many other single parents have more - but none the less, it's hard. 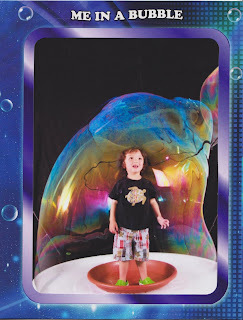 Today I took Colin to see Bubble Fest at the Discovery Science Museum. It was a gift for Colin's birthday, and so exciting too, since it was our first time seeing the show. And it was totally worth it!!! But it's days like these that I really notice Damien's absence - first, because I know how much he would have loved it, and second, because of having to handle these things alone. It was Saturday, and therefore crowded. It was a special event, and therefore extra crowded. It was 90+ degrees outside - freakish for this time of year. It was loud in the museum with lots going on. I'm dragging around the stroller (next time it stays in the car! ), my backpack, and my kid. My kid, who has a mind of his own and wants to see and touch everything. We had to wait in line inside the museum before the show - and I sadly (and jealously) watched other sets of parents. One would wait in line, while the other would play with the kid(s). I miss those days. I had to try to wait in line while kind of letting Colin play - which came to a halt the minute he disappeared behind a corner, and Mommy nearly had a heart attack! We finally got seated, exhausted and sweat dripping down my back, and the show started. Seeing the look on Colin's face - complete wonderment and happiness - and I know it's all worth it. We had a great time :o) And I'm not complaining ... just learning how to handle it. Life's too short to sit on the sidelines. I'd rather have a little stress and sweat for the adventure. Welcome to the single-parent life. Colin inside a bubble - I think this was his favorite part!